Many people who suffer from allergies and asthma simply mask their symptoms with drugs rather than seeking a treatment for the root cause. Both of these conditions involve an overreactions by the body's immune system to what it believes is a foreign invader. When you are exposed to an allergen (e.g. ragweed, pet dander, etc. ), your immune system produces and abundance of inflammatory hormones, which subsequently cause the symptoms of allergies and asthma to manifest. 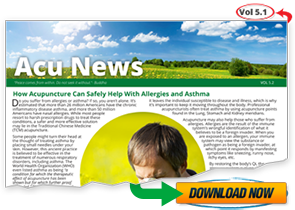 Herbal medicine is a time-tested alternative treatment for allergies and asthma. Some of the most popular herbs used to treat these conditions include stinging nettle, ginkgo biloba, green tea, and reishi, all of which contain heavy concentrations of antioxidants. These antioxidants are believed to fight harmful chemicals in the body known as free radicals, which if left unchecked, may irritate existing conditions like allergies and asthma. Contact Rebecca today to learn how you can get back on track to better health! Be Well, Stay Well, All Ways Well. Arthritis is a condition characterized by painful inflammation and stiffness in the joints. According to the Centers For Disease Control and Prevention (CDC), 52.5 million U.S. adults suffer from either arthritis, rheumatoid arthritis, gout, fibromyalgia, or lupus. (source). If you have arthritis, you should try the following tips to alleviate your symptoms. Click the AcuNews link above for a printable version of this article.